Lisa V., Bill and Marc! Congrats, 24 fans, and thanks for entering. Your awesome prizes will be on their way to your mailbox shortly. Enjoy, and thanks again for checking us out at TV Screener.com! January approaches, and for the first time since 24 debuted in 2001, it will be a Jack Bauer-less year. Sigh. For those TV fans as bummed about that as we are at TVScreener.com, Fox Home Entertainment is providing us with three copies of the 24 season eight DVD box set to give away to readers! The six-disc collection includes all 24 episodes of the eighth and final season of the Kiefer Sutherland drama, plus deleted scenes, The Ultimate CTU featurette and other bonus materials … it’s a lot of Jack Bauer in one little ol’ package! And all you have to do to have a shot at winning the final season of 24 on DVD: leave a comment on this post, with the name of the TV show you’re most looking forward to watching this winter and an e-mail address where you can be reached, and you may be a winner. Good luck, Jack Bauer fans! I’m looking forward to Supernatural! If I have to choose…Burn Notice. I’m looking forward to The Cape! Not much on TV to look forward too w/ out Jack Bauer coming back this January. 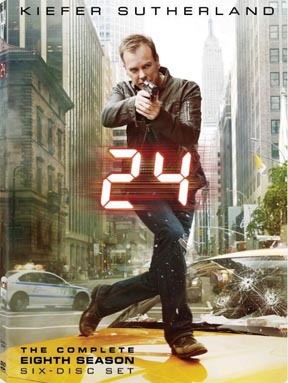 I’ll be re-watching all the 24 seasons on DVD! Fringe, when it comes back.